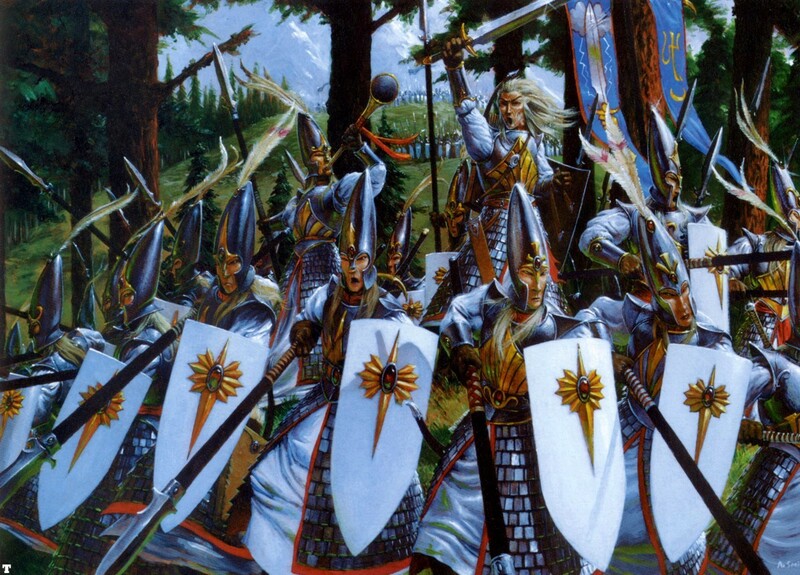 As described in the first edition core books, elves are problematic for any campaign setting intended to have a historical background that is meaningful yet not overly deterministic. The core of this issue is made clear on page 13 of the DMG: a venerable high elf — the presumed standard elf as per page 16 of the PHB — with a bit of luck and healthy living can hope to see their 1500 (if not 1600) birthday. In other words, the default AD&D setting has NPCs running around who in our world could have been personal friends with King Hygelac of the Geats (d. 516 C.E.) long before his story was co-opted into Beowulf. Consider for just a moment how different our conception of history would be if eye-witnesses to fifteen or sixteen centuries were wandering around and able to answer our questions. 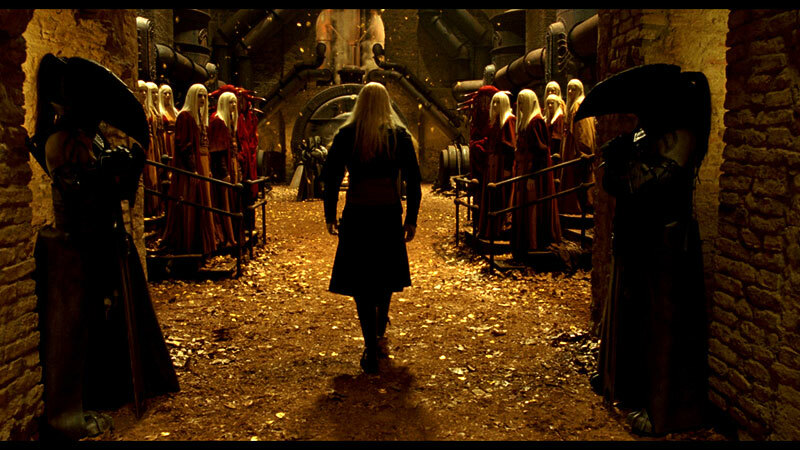 Yes, yes … I know that elves are supposed to be aloof and insular with no concerns about the world outside their society because Tolkien said so, but aloof is not the same as ignorant. That’s not even getting into the question of why a race that must put up with the world for longer than anyone else would think it’s a good idea to sit back and let the chips fall where they may rather than actively seek to shape their environment. In any event, it all boils down to the fact that by-the-book elves undermine our standard view of historical knowledge in which its possible to have competing narratives of events that only happened a couple hundred years ago and to be completely ignorant of basic information about life a thousand years ago. You want an ancient civilization that no one knows much about in your standard setting? It’s going to have to be many thousands of years since its fall or else your average elderly elf may have visited that civilization’s capital city in its heyday. For reasons that will become clearer as this series and the play reports to follow progress, this was not a satisfactory solution for me. Instead, I decided to peg the lifespan of high elves to the standard given for mountain dwarves, effectively chopping off a thousand years. That made it possible to have ancient history that was mysterious and yet not so ancient as to be meaningless. Now it was time to tackle the other Tolkien-inspired clichés. AD&D elves have a lot in common with Tolkien elves and Tolkien elves are worn out from their endless struggles against evil. In the original context of The Silmarillion or Lord of the Rings, that makes perfect sense. Outside of that context, though, it is hard to justify the kind of apathy among elves that would lead to the human-centric world that is also an assumption of the AD&D rules. This is not really a great insight on my part — others have wrestled with this same issue and one common solution has been to depict elves as victims of the human race’s expansionist tendencies who now hang on the edges of society as a marginalized people (e.g., Dragon Age, The Witcher series). That’s not bad, but that solution is becoming a bit of a cliché in its own right and my solution was to assume that act of marginalization was in the Curabel setting’s past and to consider what a elven society that has come back from the brink of extinction at the hands of mankind would look like once the counter-revolution is over. In other words, what kind of society would those Bolshevik elves create once freed from the Tsarist oppression of a human empire. The “North Island,” originally designated a penal colony for elves, has now been adopted as the elven homeland in Curabel and rechristened Valhal (Wood home). These elves are friendly with humans – especially descendants of the imperial colonists – but human forgetfulness of history sometimes strains that relationship. This isle supplies the great trees for ship masts throughout Curabel. Vallande is the only city-state on Curanost – indeed, it is the only city of any size at all on the island. 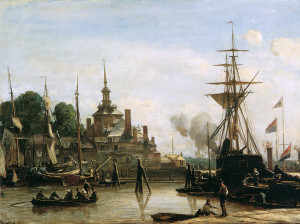 The city is notable for its lumber yards, sizable harbor, and plentiful parks. Note: Curanost technically refers to several of the northernmost islands (hence the plural construction used). However, in common usage, the name refers to the largest of the north islands. 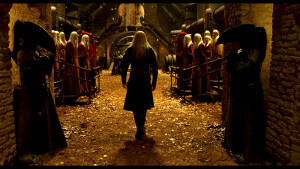 Elves are political exiles and Curabel is their penal colony. The unstated assumption here is that they were designated enemies of the human empire, hence their special closeness to the descendants of the imperial colonists who led the rebellion against that empire. This has come up in the ongoing campaign in the person of an Elven sage named Aldus Runnelbrook. Aldus, who now runs a bookstore, was a leader in the rebellion and responsible for organizing the underground presses turning out anti-imperial propaganda. The Elves have a strained relationship at times with humans because that other race is forgetful. In other words, elves remember the revolutionary struggle vividly and oscillate between pitying and resenting the ability of their human allies to forget the danger posed by the bourgeoisie — sorry, I mean empire. Aldus, for instance, tends to be more understanding and councils his human descendants (from a second marriage to a human) to be watchful but merciful; his oldest son (from a first marriage to another elf) still feels the loss of his mother shortly after the rebellion strongly and is more warlike, recommending a policy of preemptive violence. Note the mention of “plentiful parks” in the description of the only city-state on the island of Curanost. 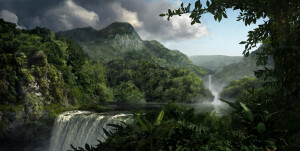 It seems like a throwaway fact, but my intention was to imply a underlying uneasiness among the elves in their new homeland — a place of wild tropical forests very different from the more temperate (and orderly) forests they lived in prior to exile. They are still closer to nature than humans, but they keep it at arm’s length because it is in some sense an alien environment. Their parks and gardens are a way to keep their past alive artificially amidst new surroundings much like many of them keep the past conflict with the imperials alive when others have begun to forget. What this all adds up to is an elven race that is significantly shorter lived than the AD&D standard, deeply involved in the post-colonial era of the Curabel islands but ignorant of their history before that time, and somewhat preoccupied with both old grievances that other races don’t recall as vividly and memories of a former homeland to which they can never return. This answers my desire in the Curabel setting to have the history of the islands be important (i.e., not too ancient) but somewhat mysterious (or at least open to competing interpretations) while explaining how the elven race can be both deeply concerned about the course of history and active in shaping it without dominating the current society of the islands. It’s also convenient that the changes are subtle enough that most of your average player’s expectations for the race are still fulfilled despite these tweaks and that no special background information would need to be provided because the more significant ramifications of the changes would only impact older, NPC elves — the player could discover the small changes in the campaign setting’s conception of elves during play rather than through an info-dump during character creation. The “Middle Island” was the administrative seat of the colonial government. After the rebellion, it became the seat of power for the strongest human city-state (Midmark – founded by the disaffected naval commander who led the rebel forces against the imperial armada). Called Midland now, this island still has the largest port and naval base in the isles. Elves call this island Valmor (Tree Grave; Val = tree, mor = death) in reference to the many ship masts swarming the harbors, while the dwarves call it Xen’Khel (Far Fortress) since it was once their northernmost settlement. This isle is home to a fleet of merchant ships that facilitate trade throughout Curabel. 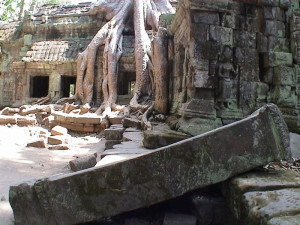 Several facts that could be translated into adventure hooks are established here: first, this location will be a prime spot for players interested in embarking upon ship-based and other aquatic endeavors; second, ruins and other locations associated with the imperial occupation should be easily accessible from this location; third, ruins from the ancient dwarven empire would exist nearby but would be from that civilization’s frontier. At the same time, I once again managed to work in some pseudo-linguistics that both extend the logic of one language (the dwarven use of Germanic compounds somewhat like Old English kennings) and indirectly characterize another culture (the specific metaphor used by the elves invoking the old tree-hugging clichés of the fantasy genre that I will soon be complicating). Midmark proper is a large city, often called the City of Gulls, on the island’s main bay. While it may be mid-sized in comparison to some mainland imperial harbors, it is by far the largest urban center in Curabel and boasts a plethora of shops and other adventurer amenities. The city is divided into several districts, although businesses related to sea-faring can be found in all but the most upscale areas. In addition to Midmark, the dwarven fortress of Xenilum’Khel (“Second Farthest Fortress”) is located in a mountain called Ramithil on the western side of the large bay. It is new and relatively small relative to the great dwarven khels of Curasur; it is also very friendly with Midmark and travel/trade between the settlements is brisk. Further inland there is an older, abandoned dwarven fortress called Xen’Khel (“Far Fortress”) that has been picked over extensively by adventurous humans from Midmark and inquisitive dwarves from Xenilum’Khel. It is widely believed that the dwarves built their new fortress for more convenient access to the water and trade, but some voices whisper of dark secrets locked in ancient halls beneath Xen’Khel that have never been penetrated by post-imperial explorers. * One of the big inspirations for Midmark was the Neil Stephenson’s depiction of Amsterdam in his novel Quicksilver — in fact, many of my notes for the campaign’s first session borrowed imagery and language from that book (I especially liked the floating shipyard he describes). Amsterdam, of course, is the exact opposite of a company outpost but I would like to think it’s reasonable that if a Dutch East India Company settlement on the other side of the world did declare independence and slowly built up their own naval-centric city-state over a couple of centuries they would almost certainly end up mimicking their one-time home. 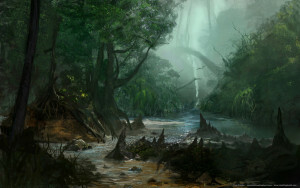 Deep Jungle by lyno3ghe (http://lyno3ghe.deviantart.com/art/Deep-Jungle-177097879). The next section of the campaign bible document consists of a high-level summary of the islands making up the archipelago of Curabel, broadly divided into major islands with centers of civilization, second tier islands with smaller populations of note and/or adventure locations, and small islands with some special claim to fame. This was not intended to be an exhaustive list, with my thought being that this area would have countless small islands (many uncharted) that would make introducing new adventure locations on-the-fly without breaking the players’ suspension of disbelief easier. More important than the geographic thumbnail sketch, though, this section of the bible is where I first decided some of the finer details of Curabel’s history, invented some (hopefully evocative) bits of its peoples’ languages, and introduced the small tweaks to the standard demi-human races that would set them apart (somewhat) from their fantasy archetypes. Many of these ideas were suggested to me by the geography of islands and how that would practically impact the development of different populations and any attempt to govern them — whether by a native empire or colonizing force. Besides pointing out the practical/gaming rationale of the islands’ layout, I will be calling particular attention to these socio-political points in the following commentary. Curabel is the imperial name for a chain of islands in the tropics of a world called Meidia. While the imperials were driven out centuries ago, the isles split into city-states following independence and no new human or elven name for the entire chain was adopted. In imperial common, the name meant “Beautiful Islands” (Cura = islands; bel = beauty). The native dwarves called the islands Weland’Khel (Water Fortress; Khel = fortress, Weland = water) and ruled the islands sometime before the arrival of the imperials – leaving behind many ruined cities and strongholds. Native humans adopted first the dwarven then imperial names. I suppose it goes without saying that, like many RPG players of my generation, J.R.R. Tolkien was a major influence on my early life — and, eventually, my decision to get a PhD in medieval literature. This first little bit strikes me as reflecting that early influence, with the pseudo-linguistic investigation of place name derivations. Looking at this now, it seems like my idea of “imperial common” is partially indebted to Latin (noun preceding modifying adjective; third declension plural form) and the Dwarven seems a bit Germanic — specifically Afrikaans according to Google translate (which is weirdly appropriate if totally unplanned). While my work on Curabel’s fantasy language is not terribly complex or extensive, I do try to be consistent in the few words and phrases introduced to the campaign and this has paid dividends during actual play (link to come when I start posting play reports). Most of the islands in Curabel are covered in tropical rain forests, although there is also a chain of mountain peaks running north-south through the islands. On some of the largest islands, like Curmidden, Curanost, Curasur, and Crescent Isle, open land has been reclaimed from the jungles and is cultivated by civilized races to supplement their mostly seafood diet. A rather pithy statement of the geography of the islands that also inspired a bit more elaboration of the imperial language, which continues to show a Latin flavor (-midden/middle, -nost/north, -sur/south). While most of the smaller islands are uninhabited, all but a handful of the larger islands have several layers of civilization both modern and ancient. First, there are the current cities and towns of Curabel. These include the larger city-states as well as innumerable fishing villages. Next, there are the abandoned imperial outposts from the colonial era, many of which were erected in remote areas after the rebellion started. Some of these were never completely cleaned out and many have been taken over by monsters and wild creatures. Finally, there are the ancient ruins of the dwarven empire, which range from the thoroughly looted and well-explored to the untouched and mysterious (the exact state often depending on proximity to later settlements). The first layer of villages and city-states provides the relatively safe locations that could serve as bases for the PC party and adventure site for more investigative/intrigue based scenarios involving imperial spies, political and mercantile rivalries, and tensions between the native islander population and colonists. * Surprisingly, this has been the main focus of the majority of the current campaign’s forty-five sessions (to date) — my assumption at the beginning was that the players would concentrate on the exploration and treasure-finding opportunities provided by the other two layers of abandoned imperial installations and dwarven ruins. * I was delighted to see Arnold K. discuss the advantages of city-states on G+ the other day given how inspiring his work was when putting together my campaign house rules. While my cities are not as gonzo as the ones he describes, the basic point he makes about smaller political entities allowing for more variety in the campaign setting is very correct. It has already come up in the Curabel campaign with the party only having visited two cities, a metropolis serving as the center of human political and military power largely controlled by the descendants of the rebel leaders and a center of mercantile activity ruled by a council dominated by competing guilds. Many of my original scribbles in the margins of notebooks about the Curabel setting are lost, but the most important bit of early planning survives as the first section of the campaign bible. Entitled Basic Design Notes, this section consists of a short numbered list of setting features and a paragraph fleshing out those points. These two items were copied verbatim from my earliest notes in order to focus my thoughts while drafting the other sections of the bible with the expectation that they would be deleted before sharing the document with prospective players. I eventually changed my mind about that, though, after realizing that they provided a perfect statement of my expectations and goals for the campaign. This list can be conveniently divided into two parts: the first two items describing the structure of the campaign, and the final three items that define its content. The first two items on the list highlight my intention to make the campaign reactive to the self-defined goals and motivations of the players. As a sandbox, for instance, the campaign would need to offer a long list of adventure hooks from which to choose and locations to explore; this choice front-loaded my preparation work and required a broad but shallow treatment of a large number of campaign elements along with in-depth preparation of a short list of high probability adventures (e.g., a introductory mission geared to low-level characters easily discovered near the starting location). It was equally important to me that the campaign not degenerate into a nominal sandbox in which a particular course of action was obviously correct or necessary. This concern informed the second point about avoiding an in-game imperative to deal with some larger issue or enemy, an insidious type of railroading in which players are offered a host of choices but then feel compelled by the logic of the setting to deal with one particular existential threat. Any player agency in those circumstances is illusory since the immanence of the threat, whether its an archetypal dark lord or impending apocalypse, will necessarily cause conscientious players to favor actions addressing that single element of the campaign setting to the exclusion of any other goals. This is not to say that having a few potential long-term nemeses is bad, since they can create excellent motivation and tie a long-running campaign together, but these threats should be designed so that they build slowly and don’t demand the players’ constant attention — in other words, a distant and long-simmering threat that is part of the background noise of the setting rather than its focus. The three items on the list that define the broad outlines of the campaign’s content reflect my desire to try something new as a Dungeon Master and, in my gaming experience, somewhat less common in fantasy role-playing settings generally. That is to say, the default AD&D setting in my experience is pseudo-European, located on a single major continent, and most often draws on popular conceptions of Celtic or Scandinavian (i.e, Viking) culture when defining its more exotic elements. A campaign set on a tropical/equatorial archipelago covered in ruin-infested jungles and distant from any major continents or kingdoms struck me as the opposite of this vanilla setting, offering plentiful opportunities to play around with under-utilized rules (weather, disease) and monsters (dinosaurs) while also allowing for the reinterpretation of old standbys (dwarves, humanoid monsters). Finally, this type of setting fit well with my proposed campaign structure since the distant and long-simmering threats could easily be located on a distant mainland or confined to overgrown ruins lost in the jungle interior. Centuries ago, colonists from a distant land settled on a chain of islands in the tropics. Using their empire’s might, they enslaved the native peoples and exploited the area’s natural resources. Over time, the empire also began using the islands as a penal work colony. Eventually, these prisoners formed an alliance with some native groups and a disaffected imperial naval commander. They declared independence, drove out the imperial loyalists, and defeated the armada sent to quell the rebellion in a legendary sea battle. This was by no means an exhaustive description, notably leaving out any mention of the ancient ruins of a technologically advanced dwarven empire or current tensions between colonists and native islanders that would end up playing a major role in the campaign, but it did help me decide that imperialism and slavery should be the key influences on the development of the setting going forward. Just a reminder - next weekend I'll be at GaryCon for the first time (woo-hoo!). I'll be manning the BRW Games table in the dealer's room, and running sessions of Castle of the Mad Archmage on Friday and Saturday nights (both are sold out, sorry! ).Do stop by and say hi, if you're in the neighborhood!